Glebe Cairn is an Early Bronze Age cairn with two burial chambers, located at the northern tip of the linear cemetery in Kilmartin Glen. There are 5 burial cairns in a long row running down the glen. Glebe Cairn is the furthest north of the row, though not the first built. 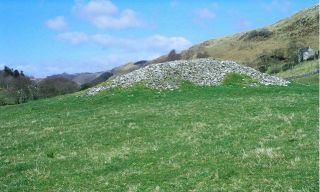 The cairn is about 30 metres across and rises 3 metres high. The site was excavated in 1864, when a single cist, or burial chamber, was found at its centre. This cist contained a necklace made of jet, with 26 beads and a couple of spacer plates. Unfortunately, this necklace was later destroyed in a fire. However, other remains found during the excavation can still be seen. These include a ceramic vessel, on display in Kilmartin House Museum, which overlooks Glebe Cairn from the northern edge of the village. A second, fragmented vessel was found in another cist near the centre of the cairn. Both of the vessels are similar to pots of the same date discovered in Ireland, so there is a possibility that they were imported from there. The earliest construction on the site appears to have been a pair of concentric rings of stones in the southwest corner. This is probably contemporary with the central cist; that is, early Bronze Age. It is a very short walk from Glebe Cairn to the Nether Largie cairns further down the glen. 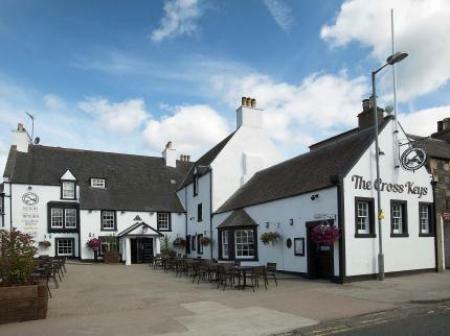 Nearby accommodation is calculated 'as the crow flies' from Glebe Cairn. 'Nearest' may involve a long drive up and down glens or, if you are near the coast, may include a ferry ride! Please check the property map to make sure the location is right for you.